This article presents lists of the literary events and publications in 1846. January 3 – American author Edgar Allan Poe prints the final edition of the Broadway Journal, a journal he owned for only a few months, with the final issue dated this day. Poe also publishes "The Philosophy of Composition". January 15 – Fyodor Dostoevsky's first original novel, Poor Folk (Бедные люди, Bednye Lyudi), is published in the St. Petersburg Collection. January 21 – First publication of The Daily News, edited by Charles Dickens, in London. After 17 issues Dickens hands over the editorship to his friend John Forster. 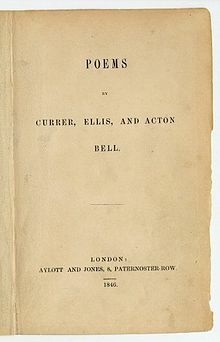 It continues until 1930.
c. May 22 – The Brontë sisters' first published work, the collection Poems by Currer, Ellis, and Acton Bell, is issued in London. It sells just two copies in the first year. June 27 – Charlotte Brontë completes the original manuscript of her novel The Professor; it is offered to several publishers this year but rejected. August 15 – Inauguration of Scott Monument to Sir Walter Scott in Edinburgh (Scotland). September 12 – Poets Elizabeth Barrett and Robert Browning marry privately in St Marylebone Parish Church, London, departing for the continent a week later. October 1 – Serial publication of Charles Dickens's Dombey and Son begins. November 21 – The String of Pearls: a Romance, probably written by James Malcolm Rymer and Thomas Peckett Prest, begins serialization in Britain, the first literary appearance of Sweeney Todd. Mary Howitt's Wonderful Stories for Children is the first English translation of works by Hans Christian Andersen published in book format. Isaac D. Baker and Charles Scribner form the New York City publisher Baker & Scribner, predecessor of Charles Scribner's Sons. ^ Cox, Michael, ed. (2004). The Concise Oxford Chronology of English Literature. Oxford University Press. ISBN 0-19-860634-6. ^ a b Alexander, Christine; Smith, Margaret (2006). The Oxford Companion to the Brontës. Oxford University Press. ISBN 978-0-19-866218-1. ^ "Scott Monument". AboutBritai n. Archived from the original on 2 May 2013. Retrieved 2010-11-13. ^ Palmer, Alan; Veronica (1992). The Chronology of British History. London: Century Ltd. pp. 268–269. ISBN 0-7126-5616-2. ^ Pichois, Claude. "Pour une biographie d'Étienne Jouy", Revue des sciences humaines (April–June 1965:227–252; given a synopsis in Furman, N., La Revue Des Deux Mondes Et Le Romantisme (1831–1848) 1974:12 note 5.